The main objective of this direct mail campaign was to help Evergreen Packaging Group sell more milk cartons to schools by specifically targeting school food service directors, who are responsible for placing milk orders on behalf of each school. 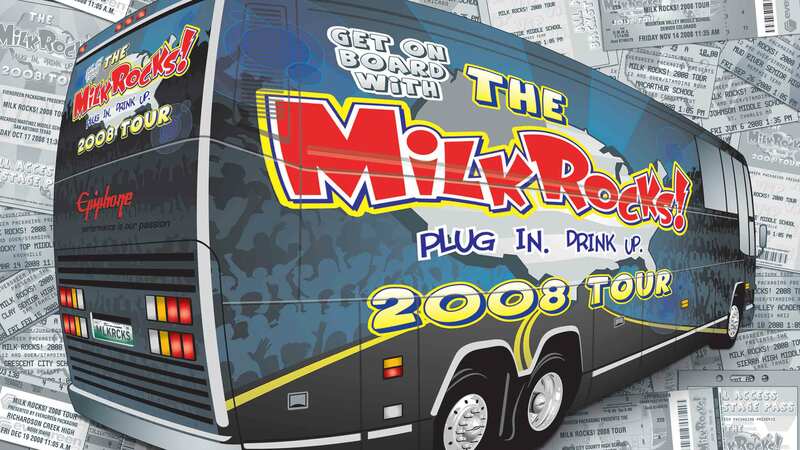 The “pull-through” style campaign included incentives, such as in-school concerts, merchandise, and school displays, to reward students who requested milk instead of unhealthy lunch drink alternatives. The more students became engaged with the Milk Rocks! program, the more they chose milk at lunch, which increased school milk demands, required school food service directors to place more orders of milk, and ultimately resulted in more milk carton production orders for Evergreen Packaging. 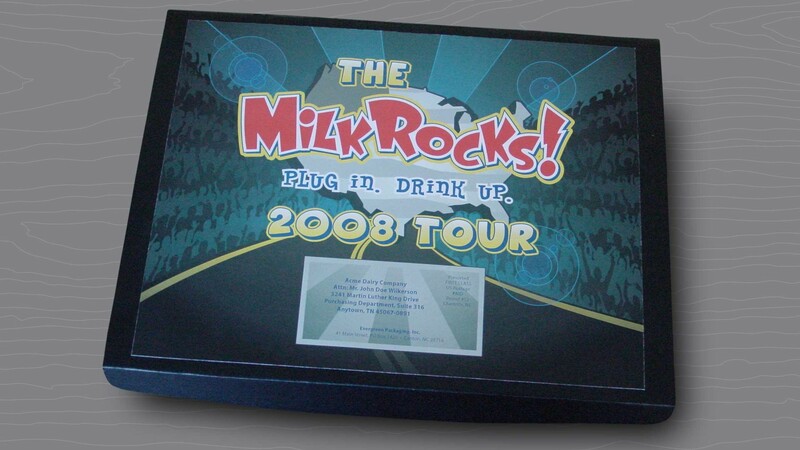 The 2008 Tour theme for this direct mail campaign was created to coincide with the available Milk Rocks! in-school concert incentives, which included a few large artists and music groups popular with the student audience at the time. 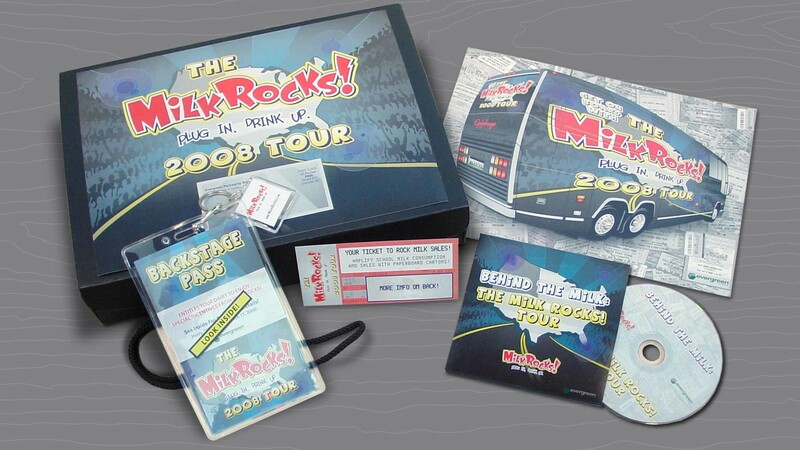 This rock-concert music tour theme became the backbone of the entire strategy of this direct mail campaign and included a mailer outer box with themed outer label, that housed a program informational brochure, a “behind the milk” music style informational DVD, backstage pass with quick facts about the program inside a backstage pass sleeve with lanyard and program keychain, and a concert ticket style call to action piece. This engaging direct mail piece became the first exposure of the program to school food service directors. Once milk orders were placed through the Milk Rocks! program, new milk cartons were then delivered to each school by Evergreen Packaging, which contained the designed theme of the direct mail piece. These striking milk cartons became the first exposure of the program to the students. 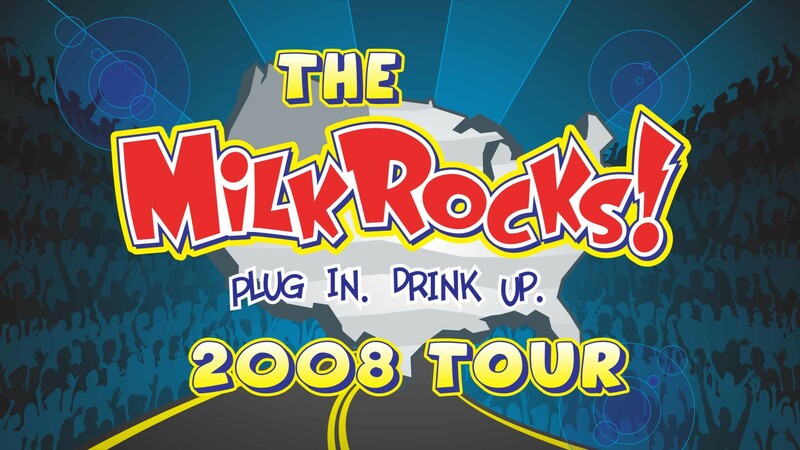 The Milk Rocks! 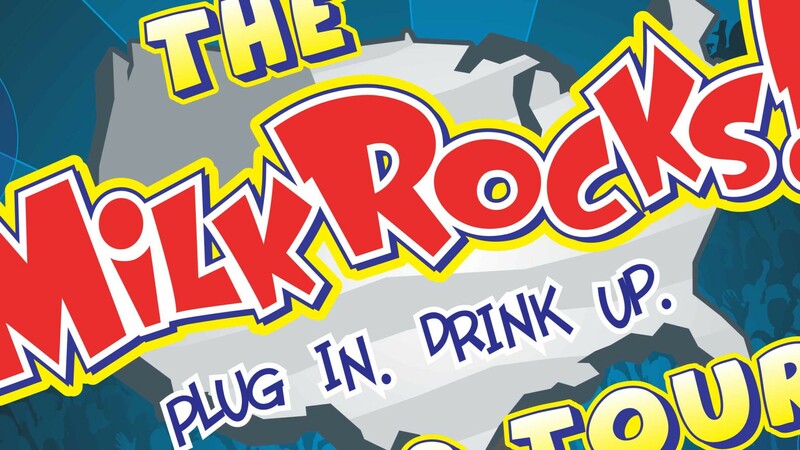 logotype was provided by Evergreen Packaging, and all of the visual graphics were created around the rock concert 2008 Tour theme. 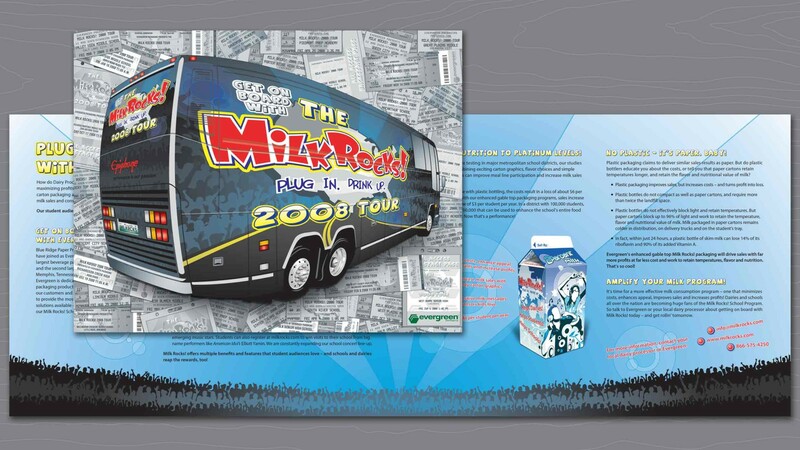 The brochure became the centerpiece of the direct mail campaign, with the front cover containing a custom-illustrated tour bus, super-imposed over a pile of custom-illustrated school concert tickets. Adding to the excitement of this concert-themed direct mail campaign was the custom image of the student crowd. Full views above of the closed outer box and opened outer box to reveal all of its contents. 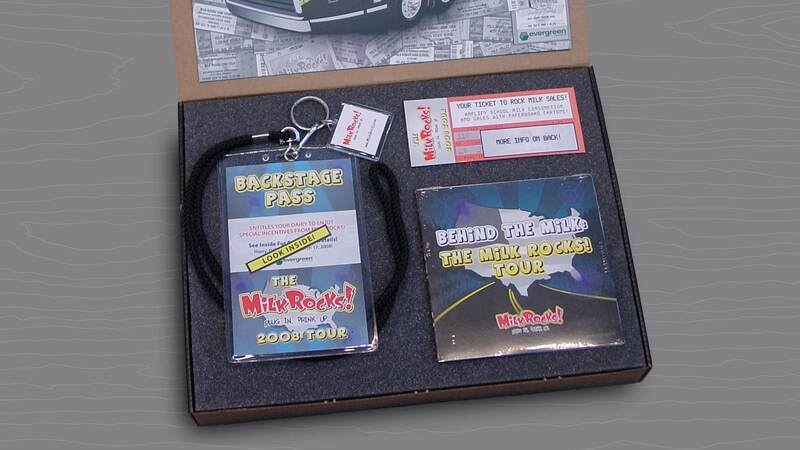 Full view of the outer box, program informational brochure, “behind the milk” music style informational DVD, backstage pass with quick facts about the program inside a backstage pass sleeve with lanyard and program keychain, and a concert ticket style call to action piece. Full view of the program informational brochure front cover and interior spread. Detail view of the program informational brochure front cover with custom-illustrated tour bus, super-imposed over a pile of custom-illustrated school concert tickets. This work was created in collaboration with other team members while I was Senior Art Director at Lyerly Agency.